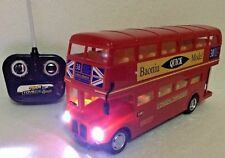 1:16 RC Remote Control London Transport Double Decker Red Bus LED Light Kids Toy 4 Channel Radio Remote Control Bus HIGH SPEED with Light Brand New & Premium Quality Product London Transport Double Decker Remote Control Bus Moves Forward / Reverse Turns Left / Right With LED Headlights when in forward motion Scale 1:16 Length 28cm Width 7cm LONDON OPEN TOUR BUS / OR COVERED RANDOM SENT Working Head Lights 27 mhz Freq. Remote Need 6 x AA Batteries ( Not Included ) Ages 3 . LONDON OPEN TOUR BUS / OR COVERED RANDOM SENT. With LED Headlights when in forward motion. Working Head Lights 27 mhz Freq. Moves Forward / Reverse Turns Left / Right. Length 28cm. It has directional steering. This is sold as seen. Passenger mirror missing. I bought it when I owned an RX-8, but sadly no more. ---4 Channel Radio Remote Control Bus HIGH SPEED with Light ---Brand New & Premium Quality Product ---London Transport Double Decker Remote Control Bus ---Moves Forward / Reverse Turns Left / Right ---With LED Headlights when in forward motion ---Scale 1:16 ---Length 28cm ---Width 7cm ---LONDON OPEN TOUR BUS / OR COVERED RANDOM SENT ---Working Head Lights 27 mhz Freq. Remote ---Need 6 x AA Batteries ( Not Included ) Ages 3 . A Drawing of possibly a Scottish Fifer??. or Cornish Cobble??. See photographs for details. remote control subaru impreza wrx unused . Condition is New. Dispatched with Royal Mail 2nd Class. LONDON OPEN TOUR BUS / OR COVERED RANDOM SENT. With LED Headlights when in forward motion. Working Head Lights 27 mhz Freq. Moves Forward / Reverse Turns Left / Right. Use of 2 x AA Batteries in each remote (Batteries not icludded). 2 x Remote. High speed cars. 4 x AA Batteries for Bus (Not included). With LED Headlights when in forward motion. Moves Forward / Reverse Turns Left / Right. LONDON OPEN TOUR BUS / OR COVERED RANDOM SENT. With LED Headlights when in forward motion. Moves Forward / Reverse Turns Left / Right. Working Head Lights 27 mhz Freq. London Transport Double Decker Red Bus. LONDON OPEN TOUR BUS / OR COVERED RANDOM SENT. 4 x AA Batteries for Bus (Not included). LED Light Kids Toy. With LED Headlights when in forward motion. Working Head Lights 27 mhz Freq. LONDON OPEN TOUR BUS / OR COVERED RANDOM SENT. With LED Headlights when in forward motion. Moves Forward / Reverse Turns Left / Right. 4 Function Forward / Backward / Left turn / Right Turn. For Age 6 . LONDON OPEN TOUR BUS / OR COVERED RANDOM SENT. Your kind understanding and patience will be highly appreciated. We will reply you ASAP. Due to the light and screen difference, the item's color may be slightly different from the pictures. Size: 24.5x1x0.8cm, wire length 24.5cm. Due to the light and screen difference, the item's color may be slightly different from the pictures. IWe will reply you ASAP. Your kind understanding and patience will be highly appreciated. Due to the light and screen difference, the item's color may be slightly different from the pictures. We will reply you ASAP. Your kind understanding and patience will be highly appreciated.